When I bought my X5 the air conditioner worked after you drove it for 30 minutes. After that time it would cool awesome. Then it made it to 1 hour or more before it would start working. I went thru the normal test and found the compressor was running the entire time with no pressure being made. That usually means a bad compressor or a blockage in the system. But even with a blockage a compressor normally cycles on and off when this happens. This one was not cycling. Well it turns out my X5 had a variable displacement compressor. I had never encountered one of these before. The compressor itself determines output with this design. A standard compressor just compresses if its on. So it works or it doesn’t. It wont magically go to working again later if it doesn’t work at first. I first tried replacing the valve in the side of the compressor to fix this since it is involved in regulating what this type of compressor puts out but if the backing plate is bad inside the compressor this won’t fix the problem. Changing the valve didn’t fix mine. I got lucky and found a new compressor for $110 on ebay and that solved my problem. Within 2 weeks the price went up to $600. No clue why the price went up like that but it did. 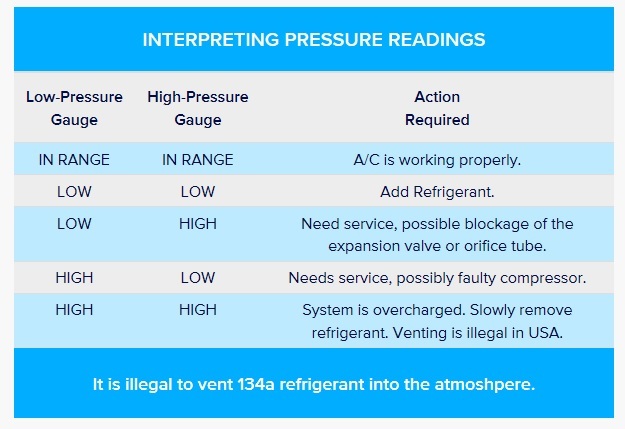 So to summarize if your air conditioner starts not cooling after cranking your X5 with the air conditioner on or if you turn it on with the switch and nothing happens but goes to working shortly later to a long time later it may be your compressor. If the system consistently takes longer and longer for the air conditioner to blow cold and works fine after the delay then it is DEFINITELY your compressor. If you ac stops cooling after its working without turning off the ac then its NOT your compressor. If you come to a stop a fast food drive thru for example or in traffic and your air conditioner stops blowing cold air its not the compressor its your fan clutch or the aux electric cooling fan. Now on to charging the system. My 2005 BMW X5 holds 1 lb of Freon. Which comes out to a can and 1/2 roughly. So how do you add 1/2 a can? Well there are 3 ways of getting there. The first is the shade tree method which most home mechanics use. You “guess” when 1/2 the can has been put in after putting a full can in. Not ideal to say the least. The second method is by weight. You use a scale to measure how much is used. Easy to do with large 30 lb containers but not so easy with 1lb small cans from the parts store. The third method is what I use. I could care less how much it holds. I measure how the system is actually working to determine the amount. 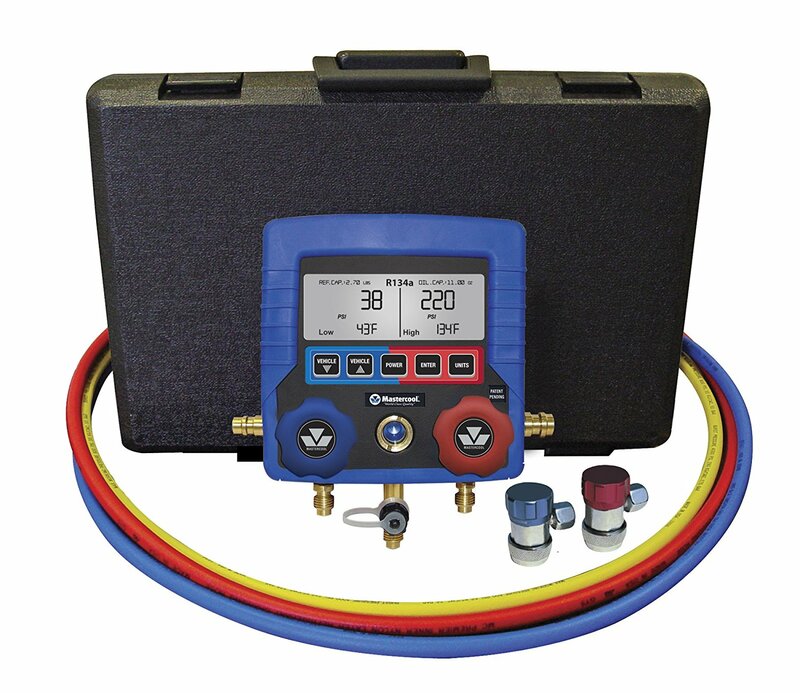 Sure I keep in mind how much the system SHOULD have in it but I use these to determine if needs more Freon or if its overcharged. This gauge allows me to lookup the Freon type and amount to put in a car just by entering the vehicle into the gauge. 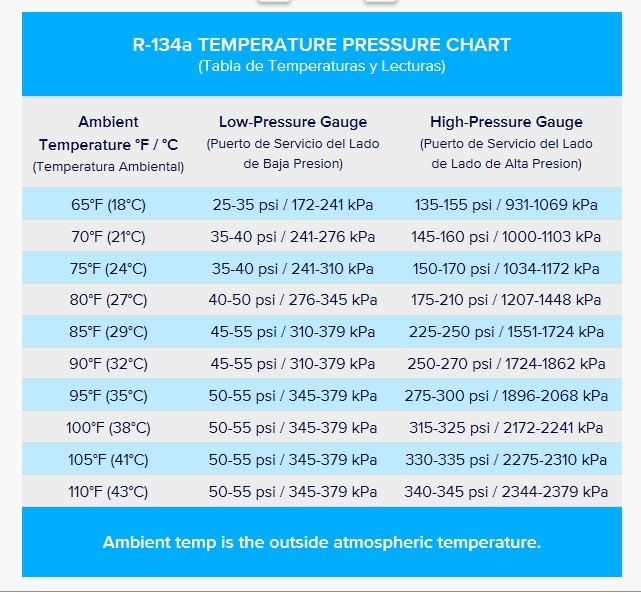 It also shows the temperature of the Freon on the low and high side. I find most howto articles mention putting the right amount in based on the readings of the gauges like above. But they never tell you what those readings should be. Kind of makes it seem like rocket science or magic. But its actually very simple. These charts will tell you all you need to know to do your own ac work. Yep its really that simple. Figure out what the air temp is outside and then read the gauges. If you use a thermometer to see what the temperature is outside and its 80 degrees then you want to see 40 to 50 psi on the low side of the gauge and you want to see 175 to 210 psi on the high side. Yep its that simple. So now we know what it should be. What do you do if its not within the range your supposed to be seeing? Yep its actually that simple.